The Troubs writing/recording project arose in 2006 from the public response to Rik's instrumental duo performances together with Dave during Emmett's concert gigs. The material on the first album centered on an acoustic roots showcase for serious guitar lovers. The follow-up came a year later, with “LIVE at Hugh’s Room”, a recording of a set captured in the fabled Toronto concert club on Wednesday December 13, 2006. Emmett (of Canadian rock band Triumph) and Dunlop (from the rock band Full Nine) first played together during a master class session at the National Summer Guitar Workshop in 1990. Much of their material originates from their acoustic guitars, with Rik singing lead vocal on some selections. But PUSH & PULL is more the sound of two Les Pauls duking it out, and also features Dave’s stunning debut as a lead vocalist on the powerful emotional ballad, Only Time Will Tell. In 2007, Strung-Out Troubadours won "Album of the Year" and "Group/Duo Of The Year" at the Canadian Smooth Jazz Awards, where they were the most heavily-nominated act. Both Rik and Dave were also nominated for "Best Guitarist", a category that Emmett had captured back in 2005. The NEW Strung-Out Troubadours album "reCOVERy room 9"
It's also at Maple Music! 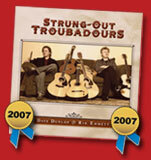 "Push & Pull", the brand new CD from Strung-Out Troubadours, released May 2 '09. 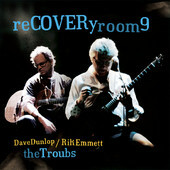 Strung-Out Troubadours - The Troubs - Rik Emmett & Dave Dunlop - have a brand new studio CD, entitled "reCOVERy Room 9". It's now available on iTunes &Maple Music! Nine somewhat unexpected and startling cover songs, performed as an acoustic duo and captured in the friendly research lab / hothouse environment of Dave's 'Room 9' studio. Emmett says: "We're hoping that people will find this work surprising and entertaining. We're taking some chances with this repertoire, but risk is part of the fun. This material, in an acoustic duo context, is also extremely challenging, and we know some folks might take umbrage with us reworking sacred, definitive masterworks. But these are songs that we love, too, and we're paying our respects - just offering our best."